Our Wind Ensemble earned STRAIGHT SUPERIOR ratings at District Music Performance Assessment last Friday night at Tenoroc High School. Kenysha Johnson, a senior euphonium player, also earned a superior rating in student conducting! This accomplishment is like being ranked top in our district and qualifying for state. Only a few select groups earn this privilege and this is the third year consecutively that our program has qualified! Our kids are working so hard to learn, perform, and produce amazing music. Congratulations on this accomplishment! Congratulations to our awesome students who participated in the County History Fair today! We had a great showing and 4 projects will go on to states! 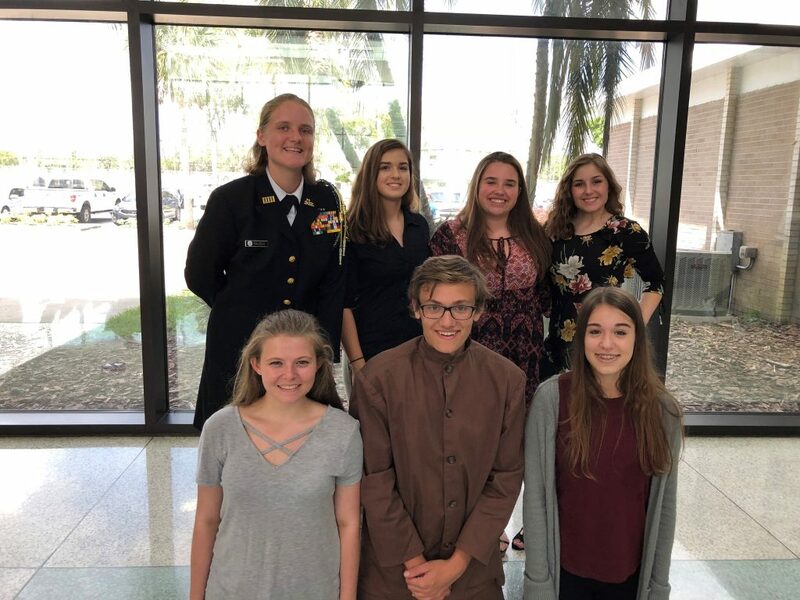 These 5 students will represent Auburndale High School at the State competition in Tallahassee in May. Congratulations to our FFA Nursery and Landscape Team of Josh Curtin, Caleb Nelson, Courtney Reyes, and Destiny Blackmon. They placed 12th in the state! Josh Curtin placed 19th individually. Congratulations! The ESE symposium is coming up on March 10. This event offers lots of great information for parents of ESE students. Attention Seniors: Please be sure to check under the College & Career tab above for scholarship opportunities! In total, there are twenty two scholarships listed and we added eight more opportunities today! As always, if you have questions, do not hesitate to stop in to College & Career and see Mrs. Cook for additional help. It is that time of year when we are starting to wrap up the loose ends before graduation. The yearbook staff would like to let you know that Senior Cap & Gown Pictures will be taken on Tuesday, February 27th here at Auburndale High School. Seniors should have received their information packets from their first period teachers, and will need to stop by room 501 to schedule their appointment prior to Tuesday morning. Students can also email Mrs. Cobb at regina.cobb@polk-fl.net to schedule an appointment. The photographer will provide the cap and gown. There will not be retakes. If you have any questions, please contact Mrs. Cobb or Ms. Kauwell at 863-965-6200 ext. 261. Ivanna Tavira showed a hog, which weighed 284 and she received a 2nd place ribbon for her piggy and 2nd place in her class for showmanship. Breanna Thornton showed her bull calf and heifer. The bull received reserved grand champion for the open show (both adults and youth can show in this category) and 3rd place over all for the youth show. Caleb Nelson showed poultry: 4 Rhode Island red hens. They got 1 blue and 3 red ribbon and Caleb placed 3rd overall in seniors for showmanship. Ciara Kintner also showed open show for a ranch; she won 2 blue ribbons for the open beef show and Division Grand Champion for the open show as well. She showed a heifer and a young bull.